Beginning with our 2017/18 Season all individual show tickets are pay-what-you-can! Accessibility is a core value at Defunkt, and we are proud to expand our pay-what-you-can policy to all performances. We live and breathe for great theater, and we want the work we do to be available to EVERYONE. Thank you to our generous longtime supporters for making this move possible. Great things are in store in the year ahead: we will see you at the theater! Read the full season announcement below! Three actors play two sets of characters with identical names living 60 years apart. In the 1950s Oliver hires Sylvia to illustrate his newest children’s book and an attraction develops between Oliver and Sylvia’s deeply closeted husband Philip. In the present day, Philip and Oliver are a couple on the rocks due to Oliver’s resistance to monogamy and his emotional attachment to his best friend Sylvia. 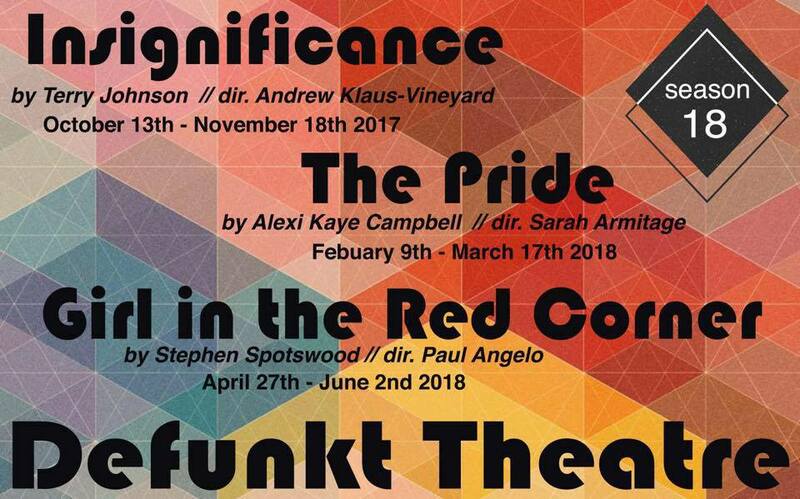 Defunkt’s Executive Director Sarah Armitage directs this Olivier-award winning play which cuts back and forth between two eras to challenge notions of love, faithfulness, and the nature of liberation. Halo has been knocked down: she recently got out of a terrible marriage and quit her dead-end job two weeks short of getting unemployment because her boss was sexually harassing her. Her life changes when she meets Gina, a trainer at the local MMA gym. As Halo begins to train, her inner warrior emerges, complicating her relationships with her mother and sister and challenging her image of herself. Defunkt’s own Paul Angelo directs the West Coast Premiere of this extraordinary new play by Stephen Spotswood (In the Forest, She Grew Fangs). Defunkt Theatre’s 2017/2018 Season No Holds Barred is made possible by support from Ronni Lacroute and Ellyn Bye.